Okay, so eggnog season has finally come. 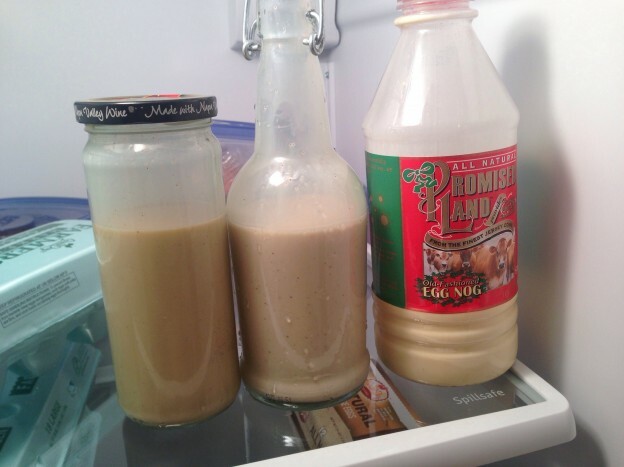 Two of my batches of eggnog (the first batch was from this post) were ready to be enjoyed! In the photo above you can see all that’s left of my eggnog: batch 2 is on the left, batch 1 is in the middle, and the best store-bought is on the right. Batch 2 I made in July. I noticed after I made the batch that the directions are different depending on if you use Alton’s milk mix or just do what he says for half and half version. The difference was that batch 2 ended up with a quart less half and half in it (and fluid in general). This made the eggnog darker, stronger, and thicker. Still very tasty though. This is actually the batch that I got to have the most of. Batch 1 was made in December of ’12. It is super tasty. I am not sure if it was the extra age, the extra half and half, or the sweeter bourbon I used, but it was very drinkable. I’m not entirely sure where it all went. I know a big chunk of it went to a friend in a trade for a bottle of home-made Kahlúa. A few others went as gifts and, all in all, I was left with a little more than what is in the bottle in that picture. Batch 1 was much sweeter and it was thinner than batch 2. And the store stuff is store stuff. Good, sweet, thick, non alcoholic. And really good to mix with batch 2. I might make some again, but probably not until June or July. This entry was posted in Cooking, Life on January 2, 2014 by Andrew.